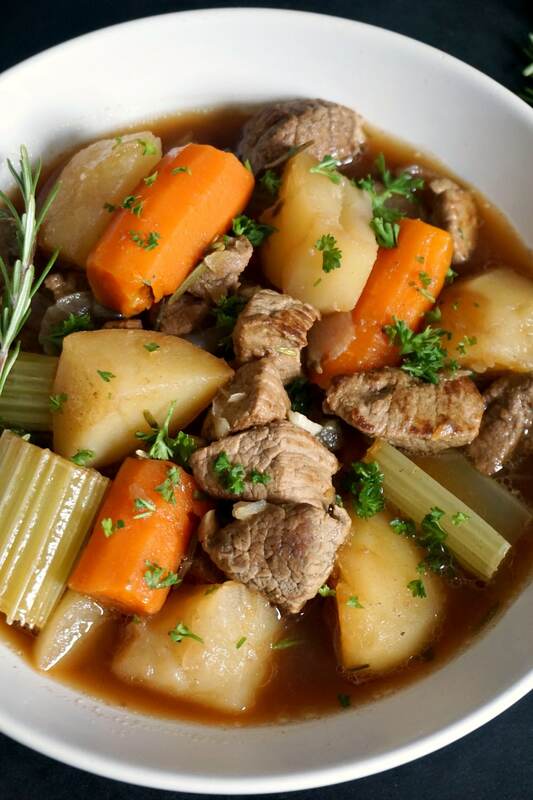 Oven beef stew recipe, the best comfort food for the cold weather ahead. Heart-warming, healthy, nutritious, this stew is one of those family favourite recipes you can never go wrong with. You know that summer is truly gone when it starts getting dark earlier. Although it’s not time yet for warm clothes, I could do with some hearty soups and stews to get me ready for what’s coming. 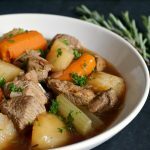 This oven beef stew recipe is just what I need, deliciously tender beef that melts in the mouth and earthy vegetables. I’ve always loved stews of any kind, and beef works particularly well with root vegetables. I tried Beef stew with sweet potatoes too, and that was a big hit in my family. This time I omitted the sweet potatoes and cooked the stew in the oven instead of the stove top. The oven definitely helps get the meat very tender, you basically dump everything in a dish, throw everything in the oven and forget about it for about one hour and a half. Pretty easy, isn’t it? If you have a slow cooker, the recipe will work very well in it too. The slower the beef cooks, the more tender it becomes. If you are in a rush though, increase the oven temperature to 200 degrees Celsius (390 Fahrenheit), and it should cook in about an hour. Otherwise, drop the temperture to 180 and cook it for longer. You will have to cut the vegetables in big chunks though, otherwise they will become mushy if cooked for too long. As for seasoning, not much is needed, since the meat and the vegetables release the most amazing flavours anyway. 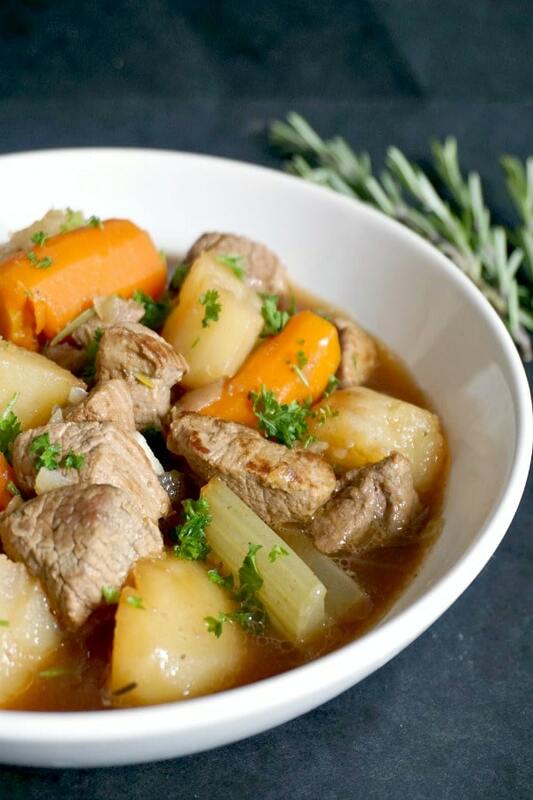 Rosemary and thyme make a great pair with this stew, and the parsly used to garnish the dish gives a nice touch and colour. 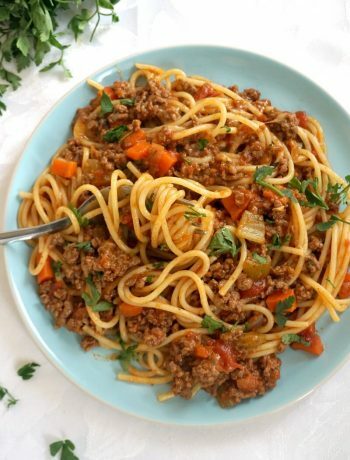 The recipe is gluten free, no flour was used to sear the meat, but you can add some if you like. 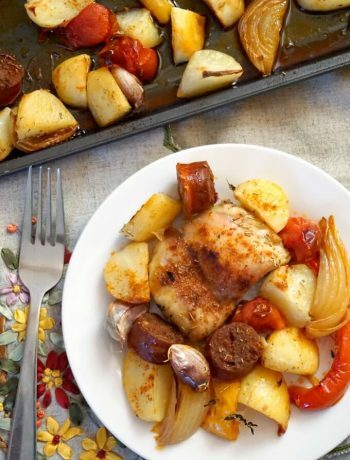 The flour would also thicken the stew slightly, so if you do not use it, but want the stew thicker, just cook the vegetables for longer, the potatoes will be nearly mushy. And there you have, a dish fit for a king. Nothing beats a good old stew, cold weather on not. So, dig in, and enjoy! 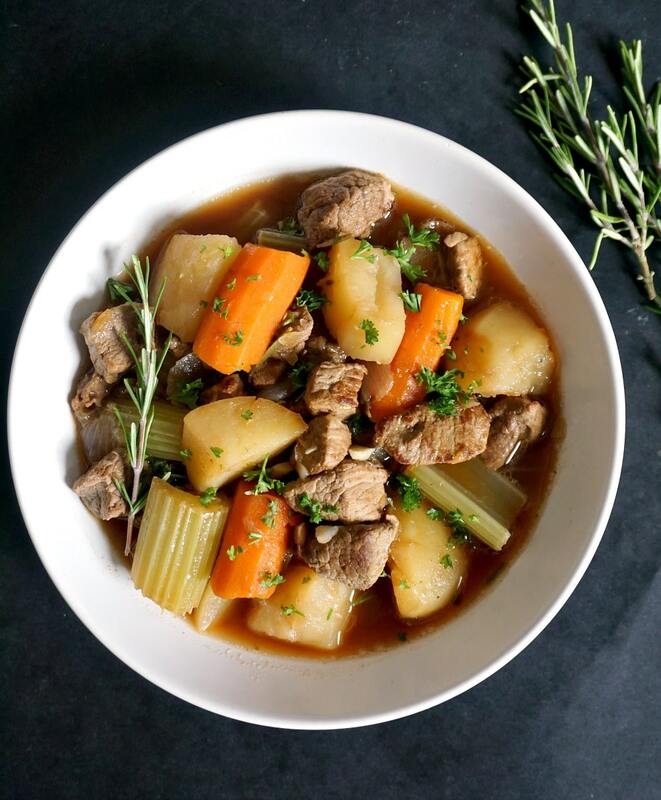 If you’ve liked my OVEN BEEF STEW RECIPE or any other recipe on the blog then don’t forget to rate the recipe and let me know how you got on in the comments below, I love hearing from you! You can also FOLLOW ME on FACEBOOK, and PINTEREST to see more delicious food and what I’m getting up to. Heat up the oil in a pan and brown the beef on both sides for about 5 minutes. Peel and cut the vegetables in big chunks, then add them to the pan together with the beef stock (broth), peppercorns, bay leaves, thyme and rosemary. Stir for 2 minutes, then transfer everything to an oven-proof dish. Cover and cook in the oven for an hour and a half at 180 degrees Celsius (356 Fahrenheit) until the meat is tender. Different ovens bring different results, so you can cook it for a bit longer if the meat is not tender enough. Season with salt to taste and garnish with freshly-chopped parsley. Serve hot! I totally agree that stews are wonderful for cold winter days, but to be honest, I can eat them at most times of year. This one looks delicious. 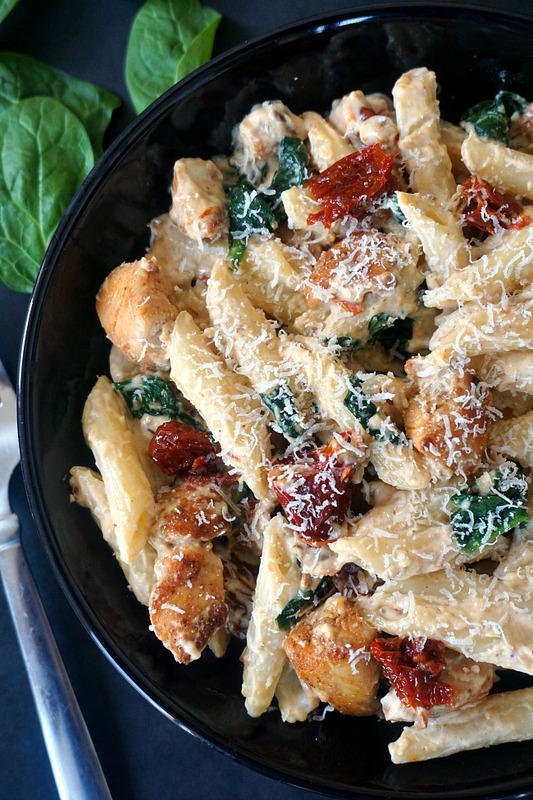 Thank you for sharing the recipe and tips about cooking. Thank you very much, Millie! I love stews too, they are delicious and inexpensive too. Looking so much delicious ! This recipes making me hungry 🙂 Can not wait any more time , i will try immediately. Yeah , i have slow cooker so hope will be delicious. 🙂 Great thanks for sharing dear.